Asthma is a common respiratory condition. It affects the small and medium-sized airways (also called breathing tubes or bronchi) in the lungs. Symptoms of asthma can vary from mild to severe. These changes cause narrowing of the airways. This leads to wheezing, cough and difficulty with breathing. Wheezing is a musical, whistling sound with breathing, usually as you breathe out. It comes from the chest – not the nose or throat. Why do some children have asthma? We do not know why some children will have asthma when others do not. We think that modern Western lifestyle may play a part in the rise in asthma that has occurred over the last few decades. Changes in housing, our diet and a more hygienic environment may be responsible – but we do not really know the cause of the increase in asthma. One in 4 children in New Zealand will have asthma at some time during childhood. See external links and downloads below for an asthma action plan and other useful resources. These are some of the symptoms of asthma in children. However, these symptoms may be due to other less common conditions. Your doctor will know. There are very good asthma treatments available, so you can stop asthma interfering with your child's life including enjoyment of sports and play. Your doctor or asthma educator will develop a tailor-made asthma action plan for your child with you. This will help you to manage the day-to-day symptoms and tell you what to do in an asthma attack. See the sample asthma action plans below. What are the triggers for asthma? Some children have asthma all year round. Others may only have it in certain seasons or when they have a cold (virus). It is not always possible to know when an attack will occur. Asthma symptoms and triggers may differ from child to child and from time to time. It is useful to know your child's triggers. Keep a symptom diary and note possible triggers. Make sure your child's environment is smokefree, wherever they happen to be. Asthma increases in children whose parents smoke. Tobacco smoke also triggers asthma attacks and makes a child's asthma more severe than it would otherwise be. Many environmental factors contribute to asthma; cigarette smoke is one that you can avoid. Asthma can be well-controlled in most children. Your child should be able to take part in all the normal activities of childhood, including energetic play and sports. You can help your child by learning as much as you can about asthma. What are signs of an asthma attack? Your child may be more comfortable sitting up so do not make them lie down. When should I seek urgent help for an asthma attack? In severe asthma it is usually better to dial 111 rather than drive your child in your own car to the hospital. If your child has any of these signs, they will need oxygen as an emergency. Emergency services carry oxygen so your child gets treatment while they are on the way to hospital. In severe asthma it is usually better to dial 111 within New Zealand (use the appropriate emergency number in other countries) and ask for emergency medical help, rather than drive your child in your own car to the hospital. Will my child grow out of asthma? Asthma is a long-term condition. The majority of children with asthma have less troublesome asthma as teenagers. Symptoms can appear again in adulthood. If your child has severe asthma, it is more likely to continue or return in later life. Your child should learn about asthma and gradually take over responsibility for its management, as they become a teenager, with support from you. Learn when you need to see a doctor urgently. Learn when you need to dial 111 within New Zealand for medical help. See Emergencies - dialling 111 on this website. This information does not include details about asthma medicines. You do need to know about the medicines your family doctor prescribes for your child. You should ask your family doctor or asthma educator. Photoboard of asthma inhaler devices (Royal Children's Hospital, Melbourne). This photoboard is for an Australian audience - some of the devices pictured may not be available in New Zealand. The diagram of the airways has been reproduced from the NHLBI (National Heart Lung and Blood Institute) website; disease and conditions index, disease topic, Asthma. NHLBI is a part of the NIH (National Institutes of Health) and the Department of Health and Human Services, United States. (These images are in the public domain; reproduction permitted). NHLBI cannot be held responsible for any other content in this fact sheet. http://www.nhlbi.nih.gov/health/health-topics/topics/asthma [Image accessed 9/7/2007]. Note this particular image is no longer available at the NHLBI website. 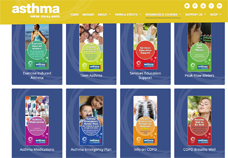 See the Asthma New Zealand brochures page for brochures on a range of asthma topics. An asthma action plan that includes how to use a spacer, how to clean an inhaler, and actions to take for different stages of asthma – from well, worse to worried. See the following fact sheets: Passive smoking and Asthma and your child - A resource pack for parents and carers. See the fact sheets: Asthma and Asthma - use of spacers. See the section on children and asthma.